The weather does not get better than this. And yes, this is low season, monsoon season, the "wet" or "rainy" season. The last 10 days have been pretty much all sun, light winds, perfect weather. The last 10 days show why I started blogging the weather. 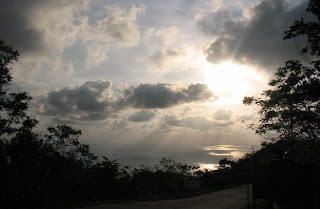 Nobody seems to believe that the weather in Phuket can be like this during the scary monsoon. Surely it's all rain and thunderstorms? Ha! The weather blog tells the truth, paints the real picture. Do you believe it now, Trinity? 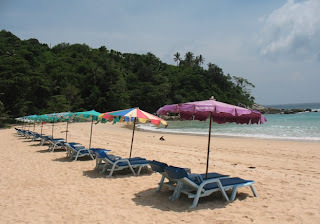 Yesterday I took a ride to Kata Noi beach at lunchtime. Kata Noi is a dead end road. Drive past Kata and keep going.. over a hill, past some luxury appartments, past the Mom Tri's Villa Royale and down to the beach. Weather was hot. The sand was almost too hot to walk on! 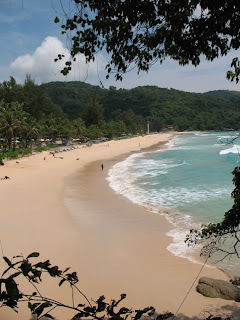 Read more about Kata Noi on Jamie's Phuket. Today has been another beautiful sunny day. I do pray for sun when I have a day off work. 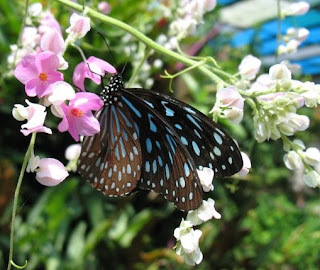 The kids wanted to visit the Phuket Butterfly Garden. I have been once before about 4 years ago. My daughter has been twice on school field trips. They recently studied the lifecycle of the butterfly. It's worth a visit for sure, especially with kids. Later we drove up to the Big Buddha, which is slowly nearing completion. Don't hold your breath. We first drove up the hill in 2002, when work had just started on the base. 6 years later... Well, eventually it will be finished. The Buddha is looking impressive now. The marble covering is nearly there. Slowly. The views from up on the hill are great. As we drove down close to sunset, the sky was beautiful. Wind had picked up in the afternoon. At least on top of the hill it was windy. Great spot for views and fresh air.